We saw ‘Patriots Day.’ We have questions. HIM AGAIN? 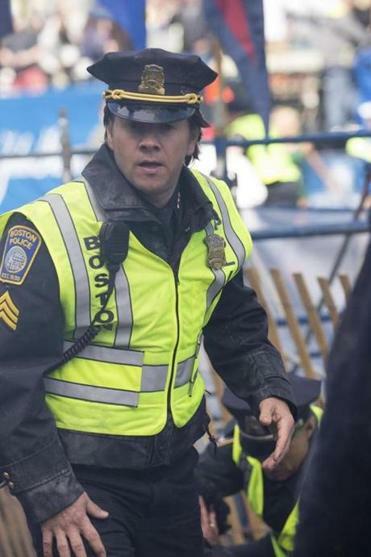 There are several real-life people whose stories are part of “Patriots Day,” but the star, played by Mark Wahlberg, is an invented character, a composite of police officers who were at the finish line when the two bombs went off and later aided in the manhunt. Why was it necessary to create a fictional character in a movie that professes to be a truthful account of the bombings? Wahlberg’s Sergeant Tommy Saunders — a cop name if there ever was one — is the Zelig of “Patriots Day.” The guy shows up everywhere and at the pivotal moment: He’s at the finish line; he’s at the gas station on Memorial Drive with Dun Meng; he’s at the shootout in Watertown; he’s got his gun aimed at the boat in David Henneberry’s backyard; he shakes hands with Red Sox slugger David Ortiz at Fenway Park. We’re not sure how many cops Wahlberg’s character is supposed to be, but it’s a lot. DID SHE KNOW? “Patriots Day” leaves the clear impression that Tamerlan Tsarnaev’s wife, North Kingston, R.I., native Katherine Russell, knew about the bombings in advance, or should have, and then protected her husband when she was questioned afterward by a female FBI agent wearing a hijab. In the interrogation scene, which is worthy of an episode of “CSI,” Russell is asked if there are any more bombs. She refuses to answer. Pressed, Russell says, “I want a lawyer. . . . I have rights.” The FBI agent shakes her head and mutters: “You ain’t got [expletive], sweetheart.” We’re not sure if any of that was said in real life, but at a screening we attended in Los Angeles, the audience roared their approval, cheering loudly when Russell was dissed. It’s fair to wonder, if the depiction of Russell is accurate, why she was never charged. Local folks may find plenty to quibble with in “Patriots Day” and that’s OK. Like every Hollywood film set in Boston, this one features a few characters with questionable accents. Actor John Goodman, for example, who plays former police commissioner Ed Davis, speaks with a drawl you might hear in New Orleans, but probably not on Newbury Street. And there’s an unintentionally funny scene in which Wahlberg’s character seems to be the only person who knows what businesses are near the finish line. He becomes the Boylston Street Whisperer, closing his eyes and conjuring the locations of Abe & Louie’s, Crate and Barrel, and the Back Bay Social Club. But none of that is the point of “Patriots Day.” Berg has made a well-intentioned, if not 100 percent factual film that honors the victims, celebrates survivors, and reminds all of us what an incredibly sad and scary time that was.